I'm finding myself being drawn to link-ups more and more often (in case you haven't noticed)! I think it's just another way to create and participate in online community, and I love that. Hmm, where should I even begin? I'm such a dreamer, y'all. Let's see here...I'll start this week with a couple of basic things. Jordan graduated on Saturday, so I'm hoping for the perfect full-time job for my hardworking husband! 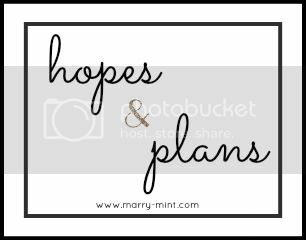 We are trusting in God's promise of a plan for us during this time, and we are eager to see what He has in store for us. I'm planning...my birthday weekend! Work lunch and off early on Friday! Dinner on Friday with the sweetest friends. Another friend's birthday party on Saturday. My actual birthday and our last small group meeting of the semester on Sunday. Taking Monday off. SO looking forward to all of these events! I'm currently reading Matched, so I'm hoping to finish it by Thursday when it's due back to the library. I'm hoping you'll dash over to Mississippi Women Bloggers to read my latest guest post there! Here's wishing you a great week, friends! Love hardworking husbands!! :) You must be so proud. I hope he finds his dream job soon. Looks like you have an awesome weekend ahead. I look forward to the recap!